1 March to 1 April 2010. Organized by Robert Epp, Gallerist, Gallery One One One. An opening reception was held for this exhibiton on Wednesday, 10 March, from 5-8 PM. The Frank Mikuska Donation. features 18 works selected from a donation by Winnipeg artist Frank Mikuska. Mikuska is best known for his powerful abstract prints, and experimental paintings using printer's ink that he made in the 1950s and '60s. The Frank Mikuska Donation includes 10 abstract paintings by Mikuska, including two major ink on gesso paintings from the sixties, along with a selection of his seminal ink graphics from this period. Works by Mikuska's contemporaries are also represented, including early prints by Bruce Head, Winston Leathers, Don E. Strange, and Marion Nicoll, as well as a rare early Tony Tascona painting on canvas from 1960. Two prints from 1950 by former School of Art professors Richard Bowman and Robert Gadbois round out the show. It is all-too characteristic of Canada that there are artists not given recognition commensurate with their contributions. Frank Mikuska is one of these artists. Born in Winnipeg in 1930 of Slovak immigrant parents, Mikuska grew up working-class in Point Douglas. Educated at Roman Catholic parochial schools, he entered the Winnipeg School of Art in 1947. He was at the School as it underwent the transition to becoming a division of the University of Manitoba in 1949-50. As part of this transition, he experienced the appointment of the American William Ashby McCloy, who in turn appointed his compatriots and University of Iowa fellows Richard Bowman, John Kacere and Richard Gadbois to faculty positions. While many of his fellows gravitated towards the charismatic Bowman and Kacere, Mikuska was taken with McCloy, whose use of encaustic impressed him, and Gadbois, a painter who introduced him to the creative and practical possibilities of graphic design. Mikuska was caught up in the shift towards an international Modernist, abstract approach and a love of jazz introduced by the young Americans and he has stayed true to his own variant of that Modernist vision ever since. In 1955 he found employment as a designer at the CBCs just-opened television studio in Winnipeg, where he worked until 1992, winning, e.g., the Prix Anik Award for animation. He and his wife Shirley Stevens (sister of School of Art alumnus Dr. Arthur D. Stevens) raised four children together. During all these years of employment, raising a family and in retirement, Mikuska never ceased working, producing one of the strongest Modernist oeuvres in Western Canada. Mikuska is a living witness to the advent and development of post-war modernity in Winnipeg, both in terms of aesthetics and of mass-media, and his work at the CBC has informed his fine art production in a profound way. In fact, Mikuska has limited himself almost exclusively to the production of works in ink on paper or masonite, reflecting the graphic sensibility of his experience with both Gadbois and the CBC. The use of this transparent medium combined with his masterful sense of colour, lends his art a luminosity that surely reflects his deep and very private spirituality. 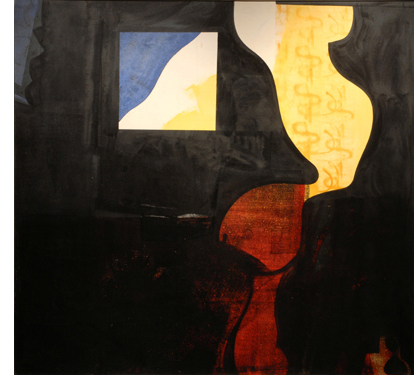 Though he exhibited frequently in group shows during the 1960s with his fellow School of Art alumni Tony Tascona, Winston Leathers and Bruce Head (sometimes referred to collectively as The Four Musketeers) it is astonishing that Mikuska has had only a single one-person show to date, at The Yellow Door gallery in 1966. What is most striking about Mikuskas oeuvre is the consistency of its quality, its economy; the focus of both its chromatic and formal means. Much like his now-departed cohorts, furthermore, he has continued to produce art of substance into his senior years. This exhibition features works chosen exclusively from Frank Mikuskas generous donation to Gallery One One One, and thus recent works are not included. Nevertheless it offers us, through the works of his professors and contemporaries of the 1950s, and his own works of the 1960s and 1970s, a view into the rich world of colour, image and form that he emerged from and has inhabited. We are very grateful to Mr. Mikuska for his generosity, and see this exhibition as a first step toward him achieving the long-overdue recognition he deserves. Gallery One One One gratefully acknowledges the support of Frank Mikuska, Julie Mikuska, Rachel Gartner, and the School of Art staff and volunteers. Thanks to Rachel Gartner fro the interview transscription. Special thanks to Dr. Oliver Botar, Associate Professor, School of Art, University of Manitoba, for curatorial assistance in producing The Frank Mikuska Donation.